I’ve been working on something really big behind the scenes here. I mean, we haven’t released something this big since our Bible Trivia for Kids Game– which is still killing it. 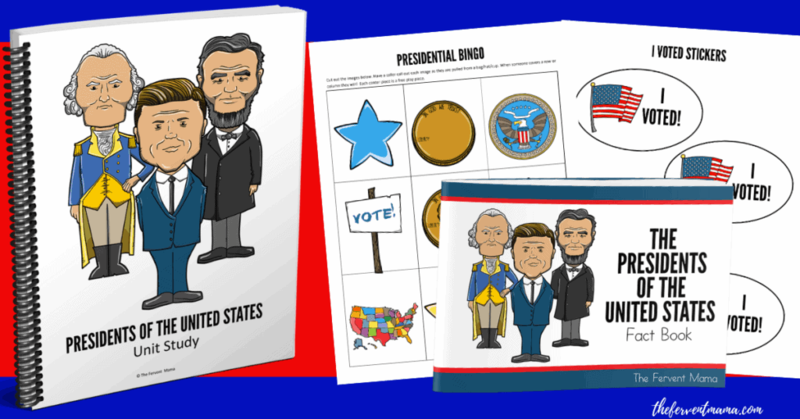 We’re giving you 49 pages of learning fun in this printable Presidential Unit Study for beginners! Here at The Fervent Mama, we’re all about sharing practical tips and ideas that help you to create a clear path to motherhood, homemaking, and homeschooling mixed with a strong faith in Christ. To do that, I can only share with you what I know, because it’s what I can relate to and I share methods that I can stand by. So, right now, our season of life is schooling littles. Which is why most of my material caters to this age group. A little lagniappe for you on this fine day. Back to the Presidential Unit Study. President’s Day is coming up and my first grader has so many questions about government, that being the president in particular. So I thought, what an opportunity to put together a President’s Day Unit Study?! Inside the study, you’ll find information on political parties, writing/drawing prompts, mock ballots, vocabulary sheets, and so much more. Even a DIY booklet on all of our US presidents! We told you that we usually offer printables and curriculum for grade school kids, but we also say that you should use that term to your own discretion! You never know if we may deem a packet for a specific age/grade while you may see otherwise! 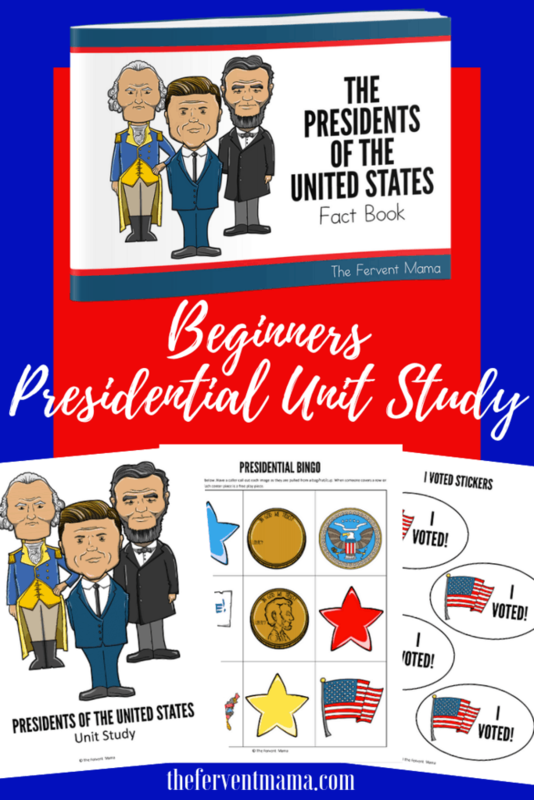 This presidential unit study is a great resource to add to the curriculum that you already use or can simply encourage children to do a little research themselves! I know I mentioned before about my first grader and how she inspired this study, and this President’s Day Unit Study would work for that age- as long as you’re prepared to lend a helping hand. Basically, we’ve given you a prompt to encourage your student to seek out answers for themselves. We believe that this method of learning is the best way to understand and process information. Click either of the images below for the Presidential Unit Study! Games, coloring sheets, stickers, fun facts- we think we’ve covered all of our bases with this one and we’re pretty proud of it all. You’ll want to scoop up this presidential unit study really quick. Looking for a community? We have a Facebook Group specifically tailored to Christian Mom’s who homeschool their kiddos! We’d love to have you join us! Head over to Fervent Christian Homeschoolers now! Interested in staying up to date, getting homeschooling freebies, or more unit studies/printable fun? We’d love to have you join our email list! By doing so, it ensures that you’ll never miss out on anything fun we send out!